Paul Beuscher Harmonium, c. 1900, made in Paris. Plaque on lid reads "Paul Beuscher 27, Bd Beaumarchais, Paris (4e) Instruments de Musique". Two octaves in length beginning on A (25 keys). 2-1/8" porcelain medallion on front. 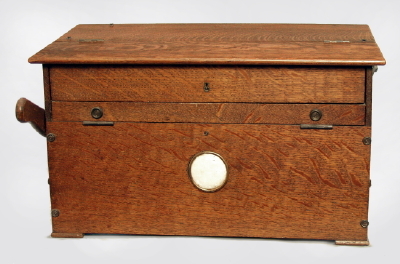 Hinged cover and lid with carrying handles on the sides. Height is 9 3/4 in. (24.8 cm. ), 17 1/2 in. (44.4 cm.) width, and 14 3/8 in. (36.5 cm.) deep. Non-functional but restorable condition; cosmetically quite good. Original Artifact. Unrestored Condition.